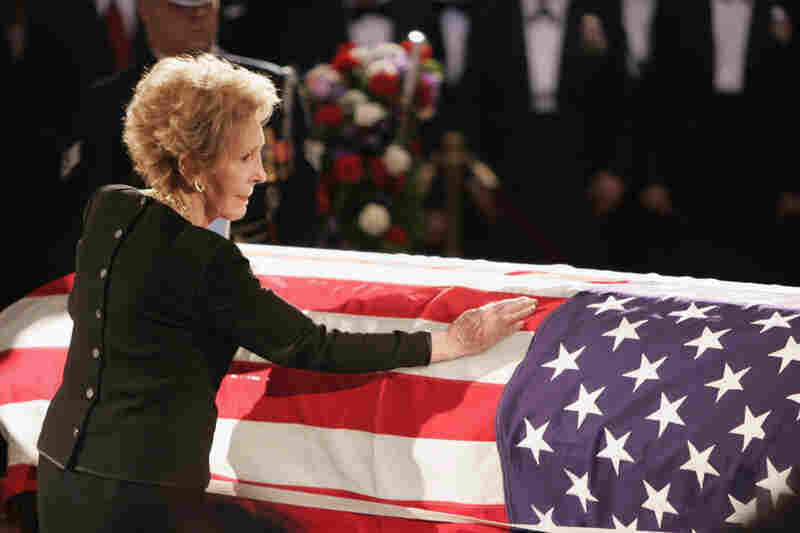 Nancy Reagan, President's Fiercest Protector, Dies At 94 The former first lady made a mark with her "Just Say No" campaign and her support of stem-cell research, which she hoped would lead to a cure for Alzheimer's, the disease that took away her husband. Actor Ronald Reagan and his wife, Nancy, gaze at one another across a table in 1952. 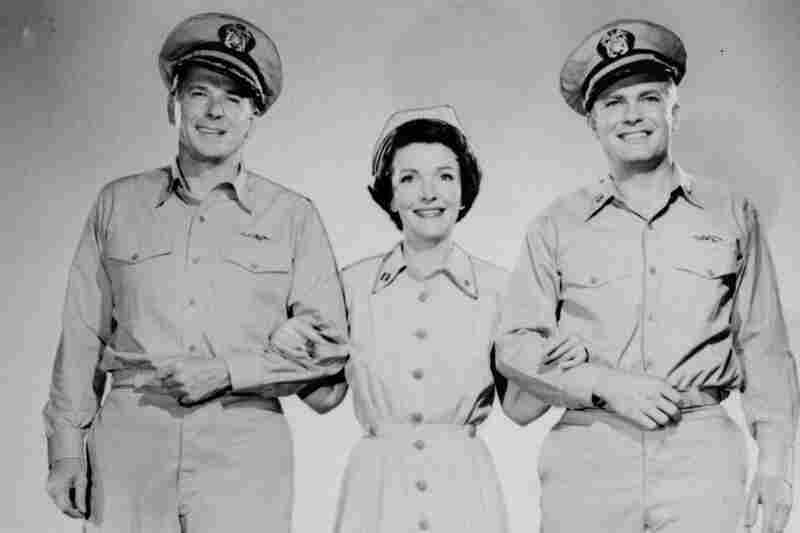 Ronald Reagan (from left), Nancy Davis Reagan and Arthur Franz co-star in the 1957 movie Hellcats of the Navy. It was the only film Nancy and Ronald Reagan appeared in together. 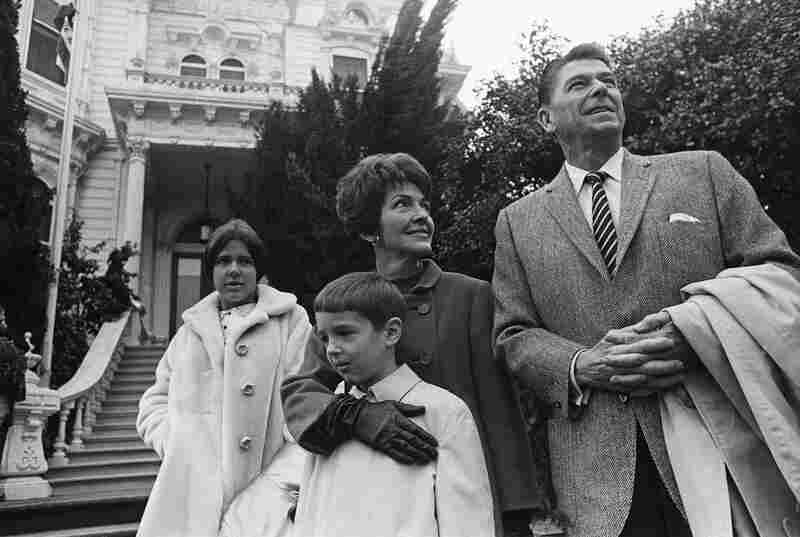 The California Republican governor-elect poses for pictures with his wife and children Ronald Jr. and Patricia outside the Executive Mansion in Sacramento, Calif., on Jan. 1, 1967. The former California governor and his wife address a crowd at a GOP fundraising dinner in New York City on Nov. 13, 1979. 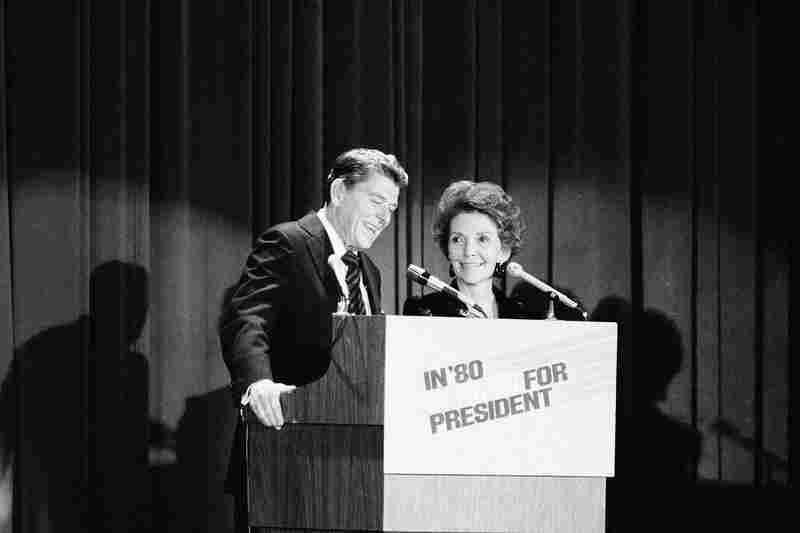 Ronald Reagan had announced that he was running for president, his third bid for the GOP nomination. He entered the crowded race as a front-runner. The first lady looks up at her husband's room at the George Washington University Medical Center on April 1, 1981. President Reagan had been severely injured in an assassination attempt by John Hinckley Jr. two days earlier. 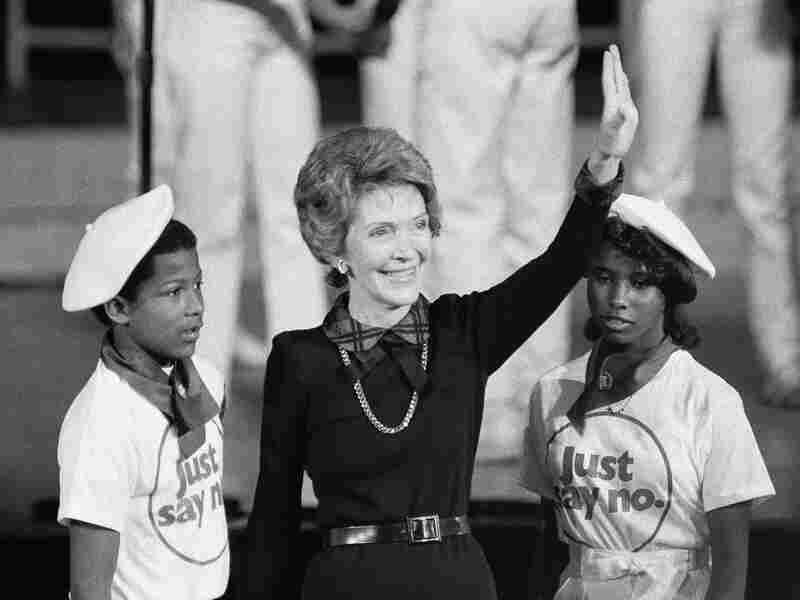 Mrs. Reagan waves to the crowd attending a "Just Say No" rally at the Kaiser Arena in Oakland, Calif., in 1985. The first lady received an award at the rally for her work opposing drug and alcohol abuse. 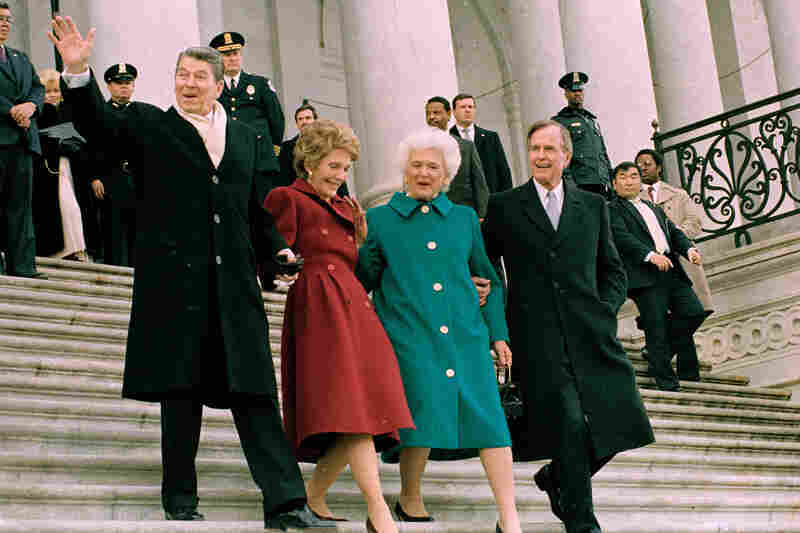 Former President and Mrs. Reagan walk with first lady Barbara Bush and President George H.W. Bush after the inaugural ceremony in Washington, D.C., on Jan. 20, 1989. Former President and Mrs. Reagan kiss during his 89th-birthday celebration on Feb. 6, 2000, at their home In Bel Air, Calif.
Mrs. Reagan touches the coffin of her husband during his state funeral on Capitol Hill on June 9, 2004. Ronald Reagan died after a long struggle with Alzheimer's disease. 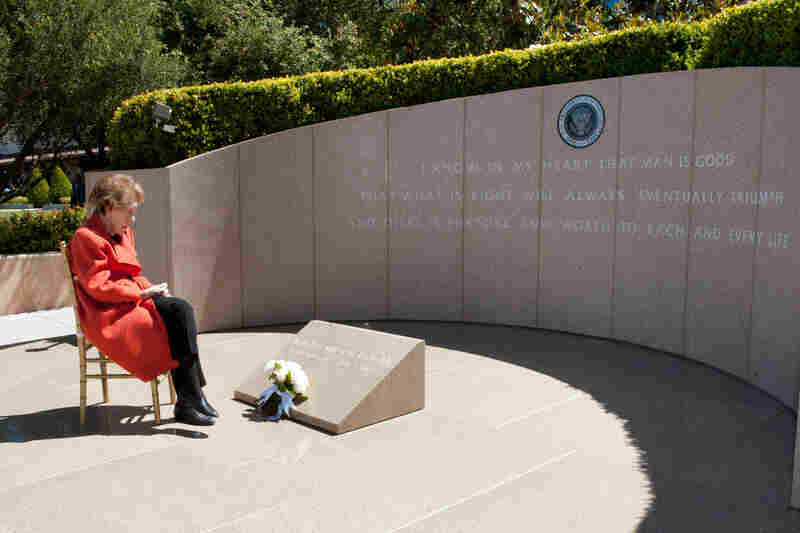 Nancy Reagan observes the eighth anniversary of her husband's death, at the Ronald Reagan Presidential Library in Simi Valley, Calif., on June 5, 2012. Former first lady Nancy Reagan died Sunday at her home in Los Angeles of congestive heart failure, according to the Reagan Foundation. She was 94. Like most first ladies, Nancy Reagan was the target of both praise and criticism. She brought an elegance to the White House that some thought was long overdue. But others said it was the sign of an out-of-touch administration during tough economic times. Reagan was criticized for meddling in White House affairs, but she was also credited with her "Just Say No" campaign against drug abuse. Later in life, Reagan nursed the former president during his long struggle with Alzheimer's disease. She later became a strong advocate for stem-cell research, in the hope that it would lead to a cure. Reagan's major role in life was to be the supportive, adoring wife of the nation's 40th president. Admirers and detractors alike marveled at their close relationship and how it sustained them during the sometimes grueling journey of public life. She was President Reagan's fiercest protector — and eventually his caregiver, as he was ravaged by Alzheimer's. Despite the criticism Reagan received during her time in the White House, her husband's difficult, final days brought her widespread sympathy. At the 1996 Republican convention, she had many, including herself, in tears. "Just four years ago, Ronnie stood before you and spoke for what he said might be his last speech at a Republican convention. Sadly his words were too prophetic," she said. Over the next eight years, Reagan watched as her once powerful husband deteriorated, both physically and mentally. It was a long, sad goodbye for a woman who said her life truly began when she married Ronald Reagan. Nancy Reagan was born in 1921 as Anne Frances Robbins. She became an actress, like her mother. But as she later told C-SPAN, it was hardly a passion. "I had gone to college and graduated and hadn't found the man I wanted to marry. I didn't want to sit in Chicago and do nothing, so I became an actress," she said. Her big break came in 1949, when, as Nancy Davis, she landed a seven-year contract with MGM. She went on to make a number of moderately successful films. But as Ronald Reagan's biographer Edmund Morris says, her real career began when she met the handsome president of the Screen Actors Guild. 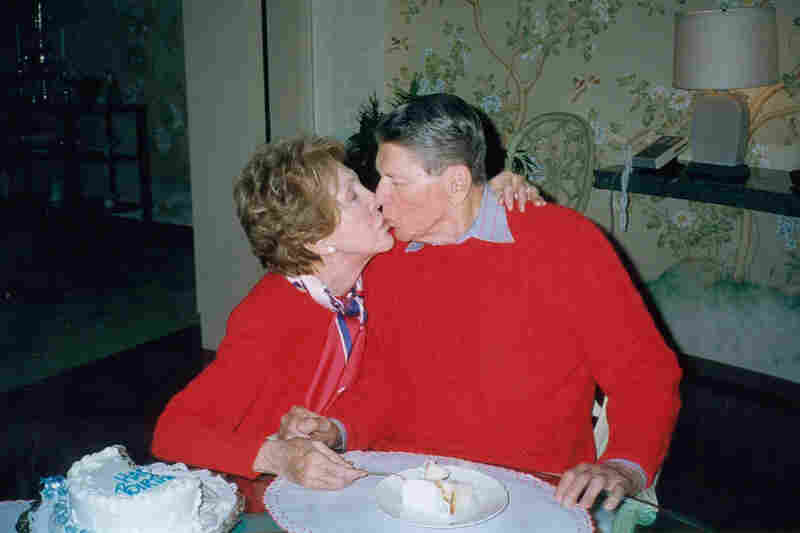 "Nancy loved Ronald Reagan with a consuming passion. He was her one and only reason for existence," Morris says. The two married in 1952. In 1966, Ronald Reagan was elected governor of California. 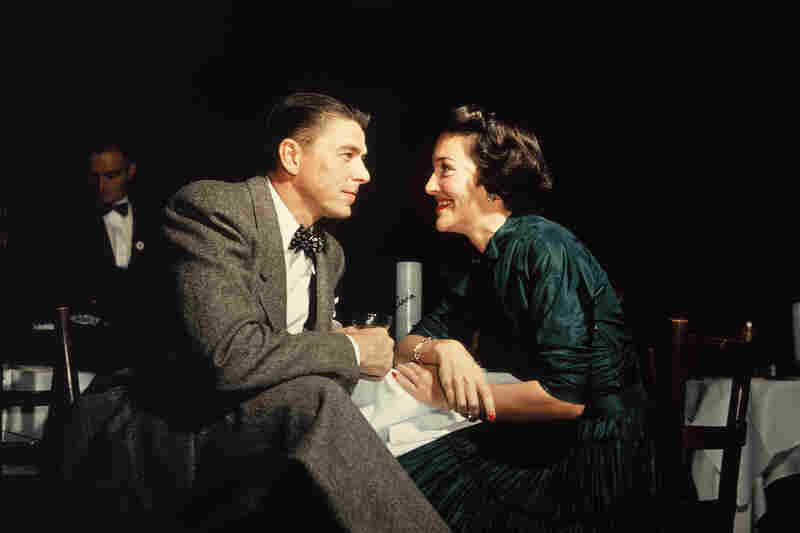 As the state's first lady, Nancy Reagan got her first taste of political sniping, most often for the doe-eyed, adoring look she always gave her husband — something known as The Gaze. But that was nothing compared with the criticism she faced when she came to Washington and decided to redecorate the White House and buy expensive new china. First lady historian Carl Sferrazza Anthony says it wasn't the best move, with the new administration cutting billions from the federal budget. "Doing this at a time of recession and high unemployment made her an unwitting symbol for the Democrats of everything that was wrong about so-called Reaganomics," Anthony says. "And she was very hurt by this." Anthony says it would take Reagan years to learn how much impact her actions as first lady could have. But those initial controversies were soon overshadowed. 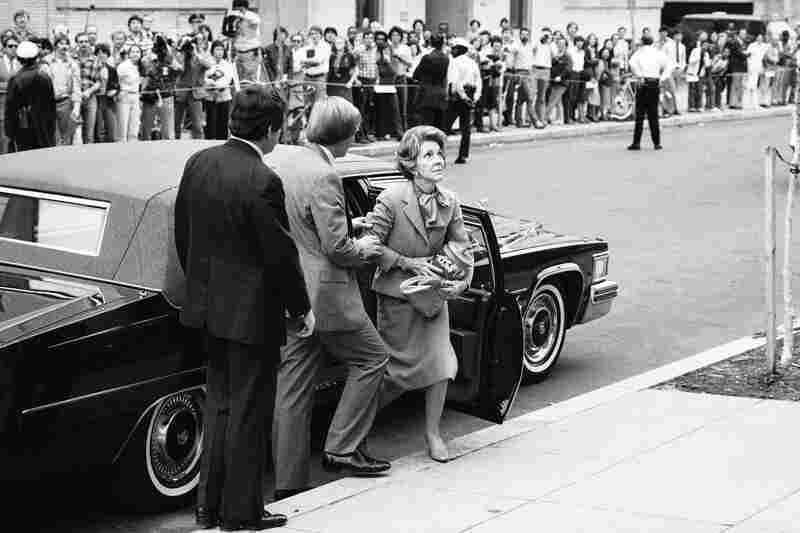 The attempted assassination of President Reagan in March 1981 devastated the first lady, who saw all too clearly how quickly her husband could be taken away. "He came very close to dying. I don't think most people knew that then. I don't think most people know it now," she said. "But there were two times that they came to me and said they couldn't find his pulse." She told NPR's Terry Gross in 1989 that it was then she decided to consult an astrologer. "When a friend called me and said I know this lady who said that if she only could have gotten to you she could have told you that he shouldn't have done anything that day," she said, "and I thought, 'Oh my lord, I could have saved him maybe.' "
Reagan began to rely on the astrologer to help set the president's agenda, something the public wouldn't know for years. She also began to take on the more traditional first lady role of promoting a pet project — in her case, the "Just Say No" anti-drug campaign. She spoke on the issue around the country and in 1986, joined the president for a televised address to the nation. "We want you to help us create an outspoken intolerance for drug use. For the sake of our children, I implore each of you to be unyielding and inflexible in your opposition to drugs," she said. But that didn't stop the criticism. In Reagan's second term, the first lady was increasingly accused of interfering in White House affairs. When one reporter asked the president about U.S.-Soviet space weapons talks, she was overheard whispering, "We're doing everything we can," something President Reagan promptly repeated. But Anthony says Nancy Reagan had only one goal in mind — protecting her husband and his image. "Mrs. Reagan I think had enormous political influence without always intending to," Anthony says. He says she was constantly on the lookout for anyone she thought didn't have her husband's best interests at heart — most notably, White House Chief of Staff Don Regan, whose ouster she helped to orchestrate. It was telling that Regan's replacement, former Sen. Howard Baker, was grilled by reporters his first day on the job about his relationship with the first lady. Morris says Nancy Reagan's political instincts were invaluable for a president inclined to trust and like everyone around him. "He needed a screen, a protector. That's the only real political function she formed for him. She could see a predator coming from a mile off," he says. Anthony adds that Nancy Reagan was more independent and outspoken than many gave her credit for. He notes, for example, that the first lady supported abortion rights in an anti-abortion administration. He thinks she also grew with the job. "You see a woman who, despite having been an actress, was at first slightly uncomfortable even giving the teacher of the year award. Then eight years later [she] is addressing the United Nations General Assembly," Anthony says. She continued to have an impact long after leaving the White House. She became a strong advocate of stem-cell research — in the hope that it would lead to an Alzheimer's cure — even though it put her at odds with many Republicans. Still, she was clearly the party's matriarch — a reminder of a popular president and the woman who protected him. At a June 2009 ceremony to unveil a statue of her husband in the Capitol rotunda, Reagan was greeted with extended applause from lawmakers of both parties. Her voice cracked as she noted that the last time she'd been in the room had been for her husband's state funeral. She then thanked everyone for all their support and left the stage. In the audio, as in a previous Web version of this story, we say that Nancy Reagan was the first first lady to address the U.N. General Assembly. While she was the first one to do so while her husband was in office, former first lady Eleanor Roosevelt addressed the U.N. in December 1948.